Hey, all! Neal Bailey here again. I managed to scoop an interview with none other than Karl Kerschl, the artist who brought us last year's Majestic storyline in the Superman books and the current Majestic mini-series, which I highly recommend reading. Q: I know that I've thrown my article-writing hat into getting you on a regular Supes book along with Abnett and Lanning, for sure. What's it like, working on Superman? Is the pressure intense, or does it feel like something you've been waiting on all your life, or maybe something else? A: It reminds me of this award show I watched a few years back - one of those lifetime achievement love-ins where all of Hollywood was toasting Martin Scorcese, and a number of the actors with whom he'd worked got up and made little speeches. In particular, I remember Willem Dafoe talking about accepting the role of Jesus in Last Temptation of Christ and saying that when he was offered the part, he took it very lightly, and it wasn't until he was about to start working on the film that he realized what an enormous and terrifying responsibility it was. I feel similarly about Superman. He's a hugely important global icon, with good reason, and while it always sounds like a kick to work on a Superman book, there's a humbling gut-fear that grabs me when I actually have to put pencil to paper. And looking back on my contribution, I'm happy with a very small part of what I've done with him (which hasn't been much, to date) because only a fraction of it feels like Superman to me. And that's the meat of it, really. You can draw a guy in the suit with an S-curl, but if it doesn't feel like him, it isn't him, you know? And the same holds true for the writing. I think if everyone approached their work on this character with the same respect for the mythology we'd see something really special. Q: What are your conditions when you draw? Meaning, do you need it quiet, or is the radio cranked? Can you describe the process? Is it like writing? Is there block? A: My work habits are appalling. I have an office and a drawing table, but I don't always work there. If I get tired of sitting in the same place, I'll grab a board and work on the couch in really poor lighting conditions, in front of the television. Or I'll prop up a surface at my computer desk and draw on that while I'm intermittently browsing through web pages or downloading stuff. It's quite pathetic, really. All of this is meant to keep me from feeling too much like I'm working. I listen to a lot of shuffled music, internet radio shows, and DVD director commentary. I take frequent breaks; it's rare that I ever do a full page in one sitting. Usually I layout the page in my head and then rule in the panel borders, then start the rough work directly on the page using a blue pencil. This process takes about half the day because I'll run off several times to get coffee, find a snack, check my mail, play with the cat, talk on the phone, nap, etc. The second half of the day is when the page gets finished. I pretty much have to be at the drawing table for this, because I need access to more tools and better light and it requires more concentration, but I'll still wander off repeatedly for just about any reason. Q: How long does it take you to do a page? A: I average between 6-8 hours of actual work time per page, but that gets stretched out to pretty much the entire waking day. I should mention here that a good portion of my time at the table involves just sitting and staring at the page. It appears to the layman as though I'm not doing anything, but it's actually an important part of the process, as it allows me to assess the decisions I've made and the ones I'm about to make concerning composition and placement of blacks. Q: You seem to have less of a history than one would expect. I know it surprised me, after seeing the quality of your Superman run and the beginnings of the new Majestic, to see that you've done a few Daily Bugles, some interior Wizards of the Coast art, and some Dragon, but other than that, it seems shameful to me that your talents haven't been used more. Maybe it's just the business, or heck, maybe I'm ignorant and it's turning around, you're lined up for the next decade J. Where will you be working in the near future? I'd like to support it. A: Every time I work on a new series it's advertised as being drawn by 'newcomer Karl Kerschl', even though I've been working in the comics industry for about ten years now, off and on. But you know, that's completely understandable, given my track record. I've turned down a fair amount of work - a few ongoing series and some other miniseries, mostly because I felt at the time that they weren't stories I was really connecting with or characters that I felt warranted several months of my life, but also because I've never felt comfortable with the thought of accepting an indefinite amount of responsibility. It's a difficult thing, working by yourself, and I have a history of missed deadlines and undisciplined (and, frankly, unprofessional) work ethic. It's only been in the last year and a half that I've been able to get things under control and produce timely work, and I'm still experimenting with different ways of improving my work experience. So, in part, turning down monthly work was a way of keeping myself (and my editors) sane. I'm better equipped to take on that challenge now, but I don't really know if I want to, or if it's something that anyone should ever do, really. I think we all have our own vision of what a character like, for example, Superman, should be, in his finest moments, and those are the moments we should be striving to capture on paper. Dragging a story out for longer than it's meant to be will always, always kill it. As a writer, Neal, you know that it's all about beginnings and endings. In monthly superhero fare, there are no endings - none that satisfy, at least. It's just a long, frustrating series of unlikely events. Hence the popularity of grand endings in books like Dark Knight and Kingdom Come. Oh yeah, so while I plan to be working in this medium for quite some time, it'll hopefully be on smaller mainstream projects and, more importantly, independent personal work I can really involve myself in completely. I've got a ton of ideas on the backburner - it's just a matter of getting one moving. I've got to stop putting these things off. Q: Given that each page of a comic is, essentially, a piece of art that someone labors excruciatingly over, and the results of this are obvious and beautiful, see the first page of Majestic for more on that, why do you think that comics are, even post-Dark Knight, given to be called such kiddy fare by the ignorant general public? A: I'm not sure the two concepts are related. A lot of people do a lot of beautiful, professional artwork aimed at children in many different mediums, and while it can certainly be excruciating labour, it always serves (or should always serve) the story. But I know what you're getting at. The comics industry (at least here in North America) is perceived as producing kiddy fare because, for the most part, that's what it still does. Maybe 'adolescent fare' is more appropriate, as the general public no longer associates comics with Donald Duck or Archie so much as it focuses on superheroes, which are aimed at adolescents. Male adolescents, specifically. I'm not suggesting that superhero books can't appeal to a wider adult audience, but the vast majority of them refuse to respect their readers, or even their characters. Adult readers, unless they've grown up with the stuff and are feeling nostalgic, don't relate to the hackneyed situations and fists-first motivations prevalent in your average superhero book. Jesus, I can barely read through an entire issue of most of them, and we're talking about 22 pages here! That's, what, five or ten minutes I can't be bothered to waste on a story? It's ridiculous. But then I have to realize that they really are aimed at a specific demographic, as much as I hate that word, and that it's okay for me to not relate to them. I find I'm really attracted to heavily character-driven stories. Fight scenes put me to sleep. literally, I've fallen asleep reading comics that are full of fight scenes. I'm not kidding. I need the characters to be really invested in what's happening to them, to be believable in a real-world sense, even though they don't live in the real world, and that just doesn't happen often enough. So, the question, then, is why adult, non-superhero comics don't sell and why they're considered kiddy fare. And that just amounts to consumer mindset and expectation. I have to believe, if I'm to sleep at night, that if we were to produce a greater variety of stories and distribute them in such a way as to not alienate and frighten the mass market, people would eventually come around. Maybe not soon, but in a few years. Maybe. Maybe we' d have the adult comic-reading commuters I dream of seeing on the metro. Like in Europe. And Japan. Maybe I'll start a new label called NeoTokyo books. Q: Superman is, of course, that contemporary government stooge sometimes, and the depressed patriarch at other times, his character is in flux, but people who aren't fans don't seem to take him as seriously these days, despite his Ur-hero status. You said in your interview that he fell out of favor with you (and I'm not chiding you for that... there are so many people doing that dance it's not even funny), I'm just wondering what it was that turned you off and what it was that brought you back? A: First, you should understand that my perception of the character has never really been based on the way he's been portrayed in the comics. I mean, reading Dark Knight did a pretty good job of making me disrespect him, but I think that's only because I was in my early teens when I read it and, more importantly, I was a die-hard Batman nut. What it really comes down to, it occurs to me, is age. Adolescence is typically an angst-ridden period in one's life, and who better to complement that dark, desperate feeling than Batman, right? Plus, he's just really cool. I don't say that lightly, either. It takes a special mix of elements to be truly cool, and Batman has it. Or, at least, he had it at some point. Superman is not cool. Period. He doesn't need to be. He represents what's right and perfect in humanity, and he exists as an ideal to which we can all aspire. I kind of think of him in the same way I think about my father; he does what's right, even when - especially when - it's difficult and unpleasant. He does everything in his power to protect his family and to enrich their lives, and he does it all with a smile. And he never asks for anything in return. Never. If I turn out to be half the man my father is, I can go to my grave happy. So I think of Superman as humanity's dad. You can imagine what a lonely, thankless job that must be, but he does it. Oh, and wait! He's the only survivor of his world! God, what more could you ask for in a character? There's no mystery as to why he's endured over the years. My appreciation of Superman grows as I write this. Q: I remember in my review that I got a bit of a jibe in at calling your Lois Thora Birch-like. A: It's funny, yours was the only review I read that actually mentioned Thora Birch by name in reference to my depiction of Lois. I had her specifically in mind as an inspiration for the design after seeing photos of her done up as a 1940's movie starlet. In retrospect, I'd have changed a few details to kind of age her a bit more, but there wasn't time on that deadline to do a lot of tweaking. All in all, I'm happy with the way it turned out. Q: Looking at it now as I compose these questions, I realize that it's also in line with your stated goal in the interview of meeting the period and the attitude at the time (20/20 hindsight, or an excuse on my part?). At any rate, the reason I bring it up is because one thing fans seem to bring attention to is that there seems to be a lack of attention to continuity, visually or otherwise. I used to be one of those guys, I'd really slam into something for failing to be in line with the rest of the series, now I'm learning to take it easy. To put it mildly, I was surprised at the depth of continuity in your story, so much so that Lois stood out, everything else was so well done, and even Lois was not in error, just different, in retrospect. Your run on Superman was one heck of an argument for consistency. For a guy who says he had to research the character, you got it pretty spot on, and I've been reading Supes for 11 straight years. What do you think an appropriate level of continuity is to character, in art OR in writing? Should we, as fans, take things a lot less seriously? A: Oh God, yeah. That is to say, I think it's important to take continuity seriously within the context of a self-contained story, but to expect strict continuity (especially visual or stylistic continuity) throughout the entire run of an ongoing book would seem to invite stagnation. The Sandman is a good example of this (not stagnation, obviously, but the opposite). I loved seeing different artists' renditions of those characters. I mean, Marc Hempel's work on The Kindly Ones was completely different from anything else that had been done on that book, but it was always consistent with itself. I loved that run. I'm glad you appreciated the consistency of my Superman work, but the reality is I hadn't read that book in years, nor was I familiar with any of the characters aside from the main ones. I didn't know who the hell Bibbo was. Or the Eradicator, or Dr. Irons, or even this new Superboy. That's all just research (made relatively painless by the internet). But Lois and Perry and Jimmy are timeless, so I'm really just drawing from my childhood. Q: What do you think is more important with art, pleasing the long time fickle nay-sayers, or getting a kid to pick up the book? Or some third option? Better still, what is most important as the goal of the piece in question to you, as an artist? A: Well, I've certainly never done anything to please long time fickle nay-sayers. Just the opposite, in fact. For some reason, drawing women a little more realistically, proportionally, seems to really shake them up. But I realize it's a losing battle. As I said earlier, these books have a very specific audience now. They're not for kids, and anyone who believes they are is fooling himself. These mainstream superhero books are tailored, intentionally or not, for the aging, nostalgic readers who grew up reading them, and drawing something to thwart reader expectation isn't really effecting any sort of change in the industry. Only new ideas and original material can do that. So, if you're gonna' do superheroes, you might as well do what's expected of you, right? You might as well please the audience, because that's what they're paying for. You can't force people to want more out of their favorite art form. To expect creativity and vision? Can you? Please? As you can see, I'm still conflicted about this. In the end, as with most things, all you can do is try to make yourself happy. If I draw a panel or a page that achieves (or, miraculously, exceeds) my expectations, I can call it a victory and move on to the next one. Sometimes I'll even fall in love with a drawing and make cow-eyes at it for a couple of days after finishing it. Those ones make the whole endeavor worthwhile. A: Lots of stuff. Lately I've been reading less fiction and more innovative science stuff. Quantum physics theories. I don't pretend to understand most of what I'm reading, but the stuff I do get really sparks my imagination like nothing else. I'm reading a really cool primer on metaphysics right now. Q: Who are your top five artists in comics today, that you read on a regular basis? Q: What are your dream projects? A: I'd like to write and direct (and design, to a lesser extent) an animated feature film. I refuse to believe that there's no audience for non-genre animation in western culture. Q: What is your favorite thing to draw in a comic, scene-wise? A: I relish those rare panels in which a character comes to some sort of revelational self-realization and becomes more than he was. Anything, really, that carries the weight of the story. And any image that gracefully symbolizes the overall theme of the story. Q: What is Superman's greatest flaw and his best quality, in your opinion? A: His adherence to what is right and good. This interview is Copyright © 2004 by Steven Younis. It is not to be reproduced in part or as a whole without the express permission of the author. The Superman Homepage has had the pleasure of interviewing various Superman Comic Book creative people about their work. Superman: The Dailies (1939-1940) Graphic Novel Review. The Rebirth of Superman (Part 1) - Superman is reborn... again. The Rebirth of Superman (Part 2) - Eddie Barganza on taking the character in a new direction. The Rebirth of Superman (Part 3) - Jeph Loeb discusses writing the Man of Steel. Lex Luthor For President - Forget Superman. An updated Luthor's new enemies are Gore and Bush. When Lois & Clark started production in 1993, there was an obvious relationship between the comic book people and the Hollywood people. A trade paperback Lois and Clark: The New Adventures of Superman, was published, with Dean Cain and Teri Hatcher on the cover. It included reprints of comic book stories that were the inspiration for Lois & Clark, helping to define the characters. Comic's included are: The Story of the Century (Man of Steel miniseries #2), Tears for Titano (Superman Annual #1), Metropolis - 900 mi (in SUP #9), The Name Game (SUP #11), Lois Lane (in ACT #600), Headhunter (AOS #445), Homeless for the Holidays (AOS #462), The Limits of Power (AOS #466), and Survival (ACT #665). A number of comic book writers and artists had roles as extras in the episode I'm Looking Through You (Season one, episode 4). Their presence was immortilized in the Sky Trading Card #34. 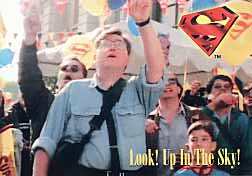 Craig Byrne, president of the online Lois & Clark fanclub The Krypton Club, carried out a series of interviews with comic book writers. The interviews are reprinted with permission of the Krypton Club. Check the Television section of this website for some Lois & Clark Interviews conducted by The Krypton Club.